The trip to and from school is an important part of the day for children and youth. It can be a chance to be outside, to spend time with parents or caregivers and friends, and eventually to develop a sense of independence. Active modes of transportation - walking, biking, scootering and more - confer the most benefits. But since 1985, in the Greater Toronto and Hamilton Area, the number of students being driven to school by their parents has doubled to over 30%, while the number traveling by active modes has fallen to under 40%. Cycle Toronto has joined the growing movement to reverse the worrying trend. We focus on what we know best - cycling - a great travel mode especially for trips between 2 and 5 km. 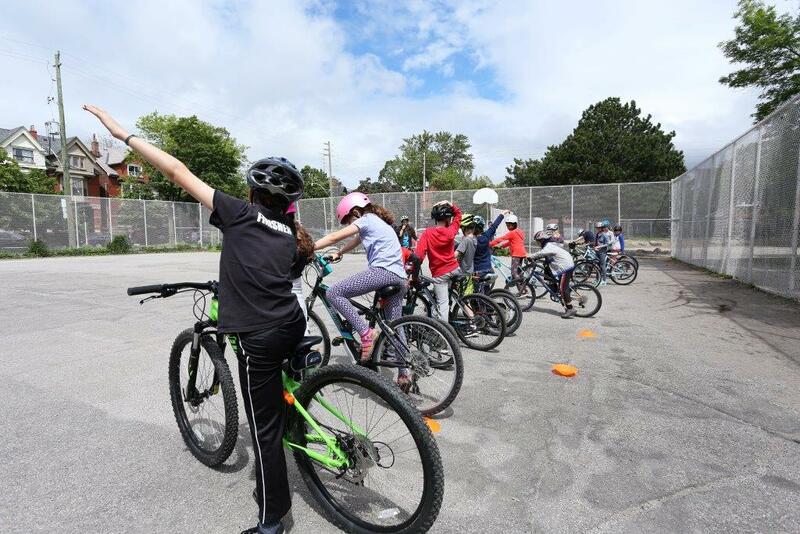 We work with CultureLink's Bike to School Project to advocate for improved cycling infrastructure in and around schools and bike education among children and youth. We are pleased to announce this new collaboration which started in the fall of 2018. Led by our long-time partners CultureLink Settlement and Community Services with funding from the Metcalf Foundation, and supported by The Toronto Cycling Think & Do Tank, this project will engage, train, and support parents, guardians, educators, and students in promoting safe cycling in their communities. This work will give a voice to some of the majority of Torontonians who would cycle if more and higher-quality bike lanes and trails were in place. The long-term goals are to build a network of school-based champions across Toronto, to broaden the support for cycling infrastructure, and to see meaningful progress towards infrastructure projects. Eglinton Ave. East (Victoria Park Ave. to Kennedy Rd.). getting a bike lane installed on a nearby street. Project staff are available to attend school council meetings and other opportunities to speak with families and educators within these four project sites. Live in one of the four project areas? Contact Sam Perry, Program Worker with the Bike to School Project, at at fesc [at] culturelink [dot] ca, to get involved or help book a school visit. reaching over 11,000 elementary and secondary school students with cycling education programs since April 1, 2016! For other inquiries or new partnership ideas, please contact Kristin Schwartz at kschwartz [at] culturelink.ca or 416-588-6288 x229. Since 2008, Cycle Toronto and CultureLink have been involved in a partnership to encourage newcomers to cycle in and around Toronto because cycling is affordable, healthy, and convenient. Our innovative partnership has been recognized with five awards, including the 2010 Excellence in Sustainable Transportation award from the Ontario Automotive Recyclers Association, the Alliance for Biking and Walking 2010 Advocacy Innovation of the Year Award and the 2016 Wheels of Change Advocacy Award from Share the Road Cycling Coalition. Find out more about the Bike Host program. The Bike to School Project - a collaboration between CultureLink, Cycle Toronto and the Toronto Cycling Think and Do Tank - acknowledges the support from the Ontario Trillium Foundation, the Toronto District School Board and Smart Commute, a program of Metrolinx. Past funders have included the Toronto Foundation, the Ontario Ministry of Transportation Cycling Training Fund, and the Toronto Bicycling Network.